"Just look at it, gentlemen. How calm...how peaceful it is. A strip of water between England and the continent, between the Allies and us. But beyond that peaceful horizon a monster waits. A coiled spring of men, ships and planes straining to be released against us. But not a single Allied soldier shall reach the shore. Whenever or wherever this invasion may come, gentlemen, I shall destroy the enemy here—at the water's edge! The first 24 hours of the invasion shall be decisive. For the Allies as well as the Germans, it will be the longest day...the longest day." Other Stars: Richard Burton, Sean Connery, Mel Ferrer, Steve Forrest, Roddy McDowell, Peter Lawford, Henry Fonda, Robert Wagner, Paul Anka, Sal Mineo, George Segal, and Fabian. The Longest Day is the story surrounding D-Day, June 6th, 1944. How were the Allied forces able to "surprise" the German army at the beaches of Normandy? Why weren't the German Panzer units stationed nearby deployed to the front? What risks did the men and boys of this conglomerate of nations take to free occupied France in 1945? Wasn't it more the fault of das sleeping Fuhrer, and his high command's fear of him, that led to the eventual downfall of the Third Reich? This epic war film takes on a scale so immense it required two years to shoot, four directors, and forty-eight international stars to play the parts. While the film unfolds from both sides of the war, the gung-ho patriotic vitriol is quite evident. 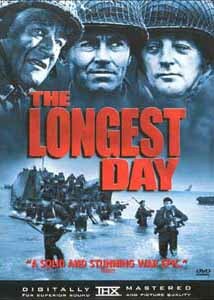 Still, The Longest Day remains one of the greatest, epic war films. Of course, Saving Private Ryan outclasses all D-Day related movies for its truth and intensity, but The Longest Day still stands the test of time quite well. As in Tora!Tora!Tora! the first part of the movie gives the political and military background leading up to the invasion, while attempting to generate empathy for the Allied characters waiting for the command to come. Some of this is corny, yet there are some wonderful moments, like the U.S. Ranger private (Richard Beymer) whose superstitious nature forces him to purposely lose the $2500 he's won in craps. Or my favorite line, the poignant "Sometimes I wonder which side God's on," recited by both sides—Lt. General Vandevoort (John Wayne) and Field Marshal Erwin Rommel (Werner Hinz). Despite a few minor exceptions (i.e., the glider crash landing special effects may have been done in my basement with my Tonka toys), the special effects are well done and nicely filmed. There are some great lengthy shots following the troops up the beach, or as they attack the hotel, and even a tremendous aerial shot from a Luftwaffe plane strafing the beach that accidentally shows the end of the set and the empty beach beyond! Because of these and other scenes, The Longest Day garnered Academy Awards® for best cinematography and best special effects. Of course, what are special effects without a strong cast? Nothing compared to the cavalcade of actors assembled here including John Wayne, Eddie Albert, Robert Mitchum, Richard Burton, Sean Connery (pre-Bond), Red Buttons, Mel Ferrer, Steve Forrest, Roddy McDowell, Peter Lawford, Henry Fonda, Robert Wagner, Paul Anka, Sal Mineo, George Segal, and Fabian. "There are only two types of people that are going to stay on this beach, those already dead and those who are yet to die." Image Transfer Review: Fox streets this disc as a non-anamorphic transfer of the film in its original 2.35:1 widescreen aspect ratio. With the exception of a scattered shot, the black and white contrast level of this transfer is superb. Blacks are black, and whites white. There are a couple of shots, when the fighter planes take off from England (ch4, 45m:20s), and later when the fleet is nearing Normandy (ch4, 45m:15s), where the black level is horribly high, most likely due to the technique of shooting a night scene in daytime then filtering called "Day for Night." On a couple of other occasions the sky or beach backgrounds are washed out. In all however, I feel these are source issues and not transfer, because other than the occasional snap, crackle, and pop of nicks and scars (i.e., ch3, 26m:00), this is a very nice transfer. Audio Transfer Review: The test disc comes with both a Dolby Surround 2.0 (FL, FR, S non-discrete) and a Dolby Digital 5.0 track. Neither of these tracks are anything to write home about, as even the 5.0 hardly fills out the soundstage to the rear surrounds (there are some minor gunfire effects here and there, i.e. at ch6, 1h:15m). It of course, lacks the low frequency bass that would have helped fill out the track. The dialogue is generally center oriented, and is well understood throughout. There is good placement of ambient effects across the front sound stage, including the damned tick-tocking of a clock (ch3, 34:00) on the left side of the soundstage that was driving me insane! There are also a few nice panning effects when the fighters taking off across the soundstage but in the background of a John Wayne motivational speech. There is however, an occasional tinnyness to certain aspects of the soundtrack, such as an alarm (ch5,10h:01m:35s) that seemed to scrape the backside of my teeth. Extras Review: This is a fairly bare bones disc, containing a non-animated interactive main menu, pictured scene selection (12 cues), an additional French language Dolby Surround 2.0 track, English and Spanish subtitles and captions for the hearing impaired, and the unrestored original theatrical trailers for The Longest Day, Patton and Tora!Tora!Tora! Note that the layer switch is at 1h:24m:27s. Missing from this edition are the laserdisc features of 48 scene cues, Movietone News footage, U.S. trailer (apparently different from the original theatrical trailer), D-Day Revisited (I assume this is a featurette), and a souvenir booklet. All in all, The Longest Day is a slightly sappy, slightly arrogant look at how clever (and lucky) the Allied powers were, and how prideful and inferior the Nazis were in comparison. Still, until Saving Private Ryan, this was the best representation of the against all odds effort made to take the Germans by surprise at Normandy. While I will continue to harp on the studios to clean up and restore their own treasures, this is—I'm sure—the nicest this film has ever been presented to Joe Average consumer. It would, of course, be nice to see some other features on the disc, but if this is on your wishlist have no worries—it's a keeper. P.S. Watch for Rommel's disappearing act in chapter 1, 5m:30s. As he walks across the screen he disappears (while still talking) and then reappears magically again. It's awfully amusing. Will someone let me know if this was in the theatrical release?